Jason Kravitz (Brussels, Belgium) on 1 March 2007 in People & Portrait. Yes, the work shot Jason :-) I love this composition and atmosphere. Great Idea for making a community theme effort, I hope I can join for the next, great composition and atmosphere! Cool picture - and I like the idea of a community theme - count me in!! BTW this is a great shot. @Bronnie: Bronnie - to real tricks or filters for this one. Just a tripod and a long exposure. The only reason for needing a filter (I think) would be for daylight long exposure like waterfalls etc but at night the dark is your friend and you can blur away! GRAND shot Jason! Great clarity and implied motion - Excellent! Lovely shot Jason, a fine first post! the motion blur accentuates the title and I love the compostion. Im a bit shoddy at the night shoots but have been trying to improve of late. Im digging the windows element, the curve of the cars, with the rectilinear backdrop, very nice. Love this Jason. A fine post even without the work theme. Some great angles and lines at work here. Super. Totally echo your sentiments too. You picture is the most differnt one on the work theme today. Love the blur which emphasizes the speed of the fast food industry. Excellent. Just found your site! I like it! Very cool shot!! Wow! Good idea and nice treatment! That's the kind of person I want working for me. Look at him. You can't stop him, you can only hope to contain him. A good idea, which make think to the idea of "fast" food... Really fast for this man! 1/2 shutter and all this blurred motion. It really shows just how busy he is. Excellent Jason, I like that idea; everyone being able to make a living off while following their passion - the world really would be a different place. 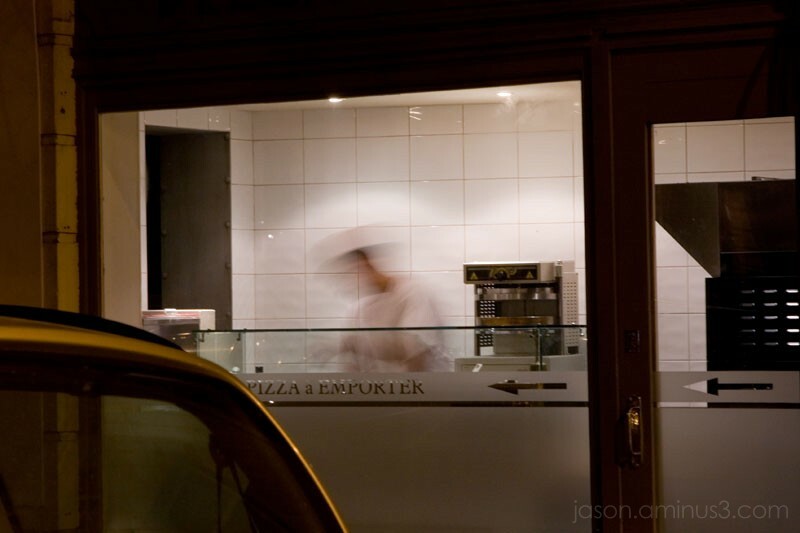 The photo's excellent, the motion blur accentuating the pace at which this person works; great stuff! Like the 'windows' idea. Another theme maybe?